‘Move over, coming through’, might well be the thoughts running through the mind of a driver catching a WRX STI looming ever larger in the rear-view mirror. Yes, since the first generation set the standard in the late 1990s, the Subaru super sports sedan still has all the moves. 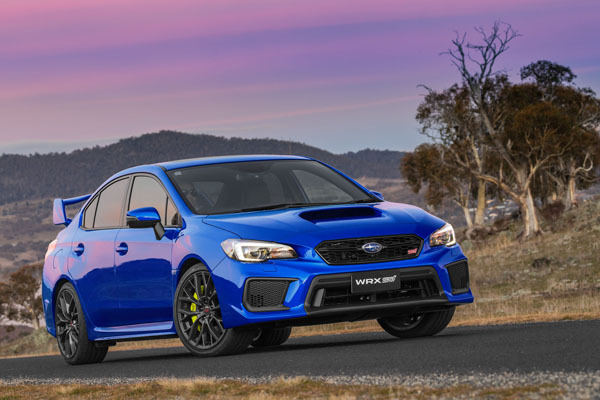 Now, the WRX and WRX STI, the latter suffix alluding to Subaru Tecnica International, the company’s performance arm, have undergone a non-too major refit for model year 2018 with both mechanical and cosmetic upgrades. 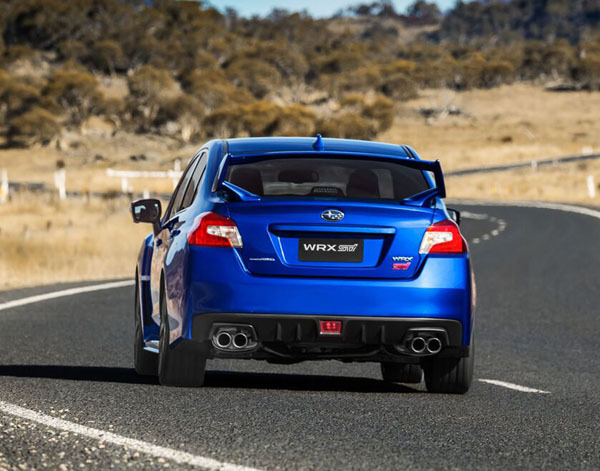 The all-wheel drive turbocharged twins share external and cabin changes to produce even more sporty presence, including a revised nose with more aggressive grille design, while the flagship range is topped off by a new model, the WRX STI spec R.
Subaru Australia showed sufficient confidence in the STI, to wheel out the base model ($50,890, plus on-roads) for my extended run. If you think the WRX STI, with its traditional high-flying rear spoiler and accentuated bonnet scoop could look any more aggressive, think again. The 2018 version of the fourth-generation high-performance Subaru has had its front bumper enhanced for a more powerful look. A border around the lower grille lower grille is blacked out and the opening enlarged to improve cooling, while 19-inch alloy wheels, finished with dark gun-metal paint offer a peek at the showy bright yellow Brembo brake calipers. The addition of the roof carrier brackets, make attaching and removing roof carrier accessories, such as bike and canoe racks, much easier. Cabin highlights with a high-gloss black finish have been provide a sportier, yet elegant feel. 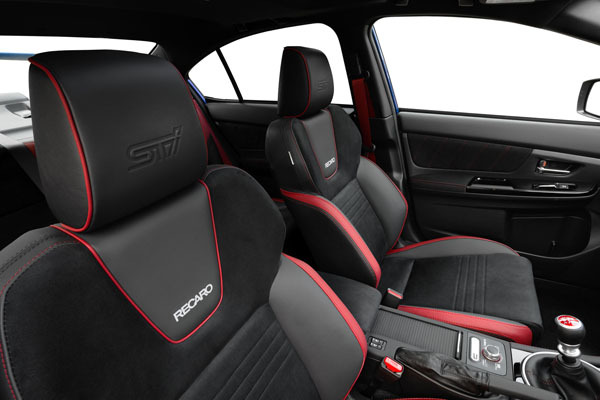 Recaro seats with characteristic top-notch support and Renault-style red seatbelts befitting a performance flagship. The gearshift surround is in high gloss black, with contrasting red stitching on the sides. Door grips are easier to grasp and the pull handle is now in Thermoplastic olefin to prevent fingers from slipping. A revised instrument panel features white illumination and red needles and tinted glass. Front and centre is a larger, clearer 5.9-inch LCD multi-function display which sets out the air-conditioning and a range of information in an easy-to-read format. Bluetooth audio streaming comes via Harman Kardon sound with eight speakers, sub-woofer and amplifier. Factory fitted satellite navigation has voice control. Aux jack and two USB ports are also included. Subaru STI has a 2.5-litre boxer engine, mated with a six-speed manual. No automatic is offered. Maximum power of 221 kW at 6000 rpm and maximum torque of 407 Nm at 4000 revs are enough to shoot the STI to 100 km an hour from rest in a claimed 5.2 seconds. Passive safety comes with full-length curtain airbags, driver’s knee airbag, plus dual front and side airbags. Front seatbelts have pre-tensioners and load limiters, with double pre-tensioners on the driver’s side. Powerful ABS brakes work on the four-wheel discs, electronic brake-force distribution and brakes assist make them even better. Forward and reverse hill-start assist is included. Vehicle dynamics control (electronic stability control) and symmetrical all-wheel drive top off the active safety features. Subaru’s Eyesight safety package is included only on CVT-fitted WRXs. The latest STI drives like the WRX we have come to know and love for many years. The boxer engine, for the most part, behaves like any middle-of-the-road four-cylinder unit. But when pushed it hits its straps with the resounding roar that’s guaranteed to bring a smile to a fan’s face. It’s not overly thirsty, always the sign of a highly efficient powerplant. The official combined urban / highway fuel consumption figure is 11.2 litres per 100 kilometres. The test vehicle recorded 11.3 in town with some highway work added on the required premium unleaded petrol. The six-speed manual gearbox can be hard work if the revs are not kept up – notchy is not the word. Stalling the motor was not uncommon on my first meeting. For ride and handling the STI still relies on the tried and tested SI-Drive system that tailors key engine functions with the choice of three driving experiences in the one car. For manual models it regulates the engine control unit and the electronic throttle. Intelligent mode (I) is for driving clever – for everyday suburban and city conditions, when power output is reduced and fuel efficiency is the target; Sport (S) brings up enhanced acceleration and all-round sporty performance, while Sport Sharp (S#) provides pure performance through bursts of power at the right moment. The first mode is most comfortable in day-to-day driving, while the last is best left for track days and the like. The centre differential switches front-to-rear torque under power in corners and back can be set manually to a rear-drive bias. Limited-slip diffs front and back and torque vectoring help keep the car on course at speed.